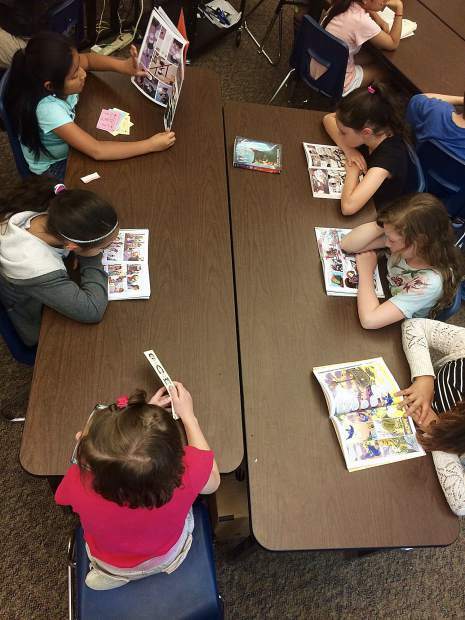 A group of Incline Elementary School students sit at their desks on June 6. Parents of the 64,000 students across the Washoe County School District breathed a sigh of relief on June 5 when the Nevada Legislature voted to provide $5 million to help with the district’s projected $13 million deficit over the next two years. But that won’t be enough to prevent all class sizes from increasing at Incline Elementary School. Morris, who has two children at Incline Elementary, said she joined the PTA this year because she felt like everything at the school was falling apart. “I’m pretty sure we all agree that our (tax) money isn’t going to per-pupil spending,” she said. Morris, like many other parents in Incline Village, said she’s frustrated because the district doesn’t provide more resources for Incline schools. But Morris said that leadership salaries within the district are also concern her. “The budget’s a big issue, but a bigger one is that when the superintendent came up with ideas to fix the budget — they cut teacher positions,” she said. Morris said she would have liked to see those making more than $100,000 at the district to consider taking a reduction in pay before firing teachers. “If you want to be rich in the private sector that’s your right, but you can’t say you’re for the kids, and then take money away for teachers,” Morris said. Back in March, Incline Elementary School Principal Dan Zimmerman warned parents that preliminary allocations from the district projected that the school may lose a total of four teachers in the upcoming 2017-18 academic year. The district calculates how many resources, including teacher positions, to dole out to a school based on enrollment and a funding formula, he said. Those preliminary calculations meant the school would lose one teacher each for first, third, fourth and fifth grades as well as half of a bilingual administrative clerk position. Over the last decade, the Hispanic student population at Incline Elementary has increased, now hovering at around 50 percent, according to data from the Department of Education. During some recent years, Hispanic students have even made up a majority of the school’s population. The district said the proposed class size increases would only put two more students in each classroom. Teacher-student ratios would remain below state and national averages, according to the district website. Zimmerman said while that may have been the case for other schools in the district, the impact was actually greater on Incline Elementary. “What it meant for class size, for fifth grade, was that the district average (student to teacher ratio) went from 26-to-1 to 28-to-1. But what happened to Incline Elementary School was 26-to-1 became 38-to-1,” Zimmerman said. That means that a single, fifth-grade teacher would have to manage 38 kids, when they were previously responsible for 26. Fourth grade class sizes at Incline Elementary were also expected to increase to 33 from 26 students. Zimmerman said that third-grade classrooms would increase to 26 students per teacher, which would have put the school out of compliance with state law. The legislature passed Senate Bill 515 in 2015, limiting the district’s ability to increase third grade class size to no more than 20 students per teacher, according to the district website. According to the website, the district board of trustees is permitted to request a variance from the board of education when an elementary school exceeds the class size requirement. Incline Elementary School is already above the class size limits for second and third grade classrooms, according to the district’s 2017 quarterly reports on average daily attendance. “Parents went to several board meetings and I did an appeal to my supervisor because they didn’t seem right to us. It was a situation where the district applied a mass formula to all schools, and didn’t really take into account how it would affect us,” Zimmerman said. In the end, the district let Incline Elementary keep the third grade teacher position, as well as the fifth grade position, but maintained the teacher cuts in first and fourth grade classes. “The first grade loss was still appropriate, but the fourth grade loss still presented concerns,” he said. With the loss, fourth grade classes at Incline Elementary this academic year will have 31 students in one class and 32 students in the other. Zimmerman said parents also reached out to the legislature while they were still in session to try and help the school, but not all of their concerns were addressed. In its final meeting of the 2017 session, the Nevada Legislature OK’d $5 million to assist the district with its $13 million deficit over the next two years ($6.6 million for each year), though Republican Assemblywoman Lisa Krasner, who represents Incline Village, voted against the financial package. “At this time we still don’t have the fourth grade position back,” Zimmerman said. 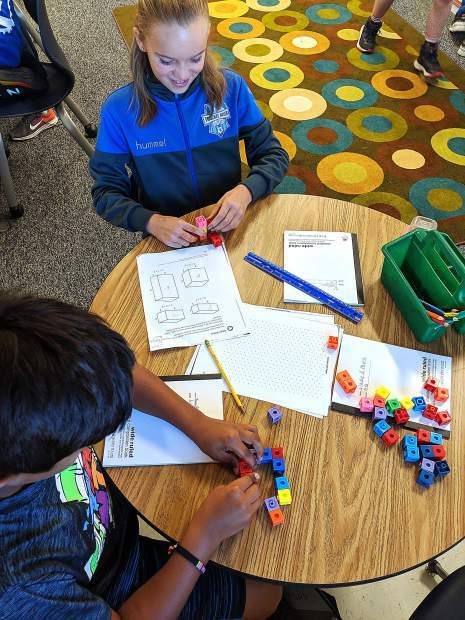 Despite the reallocation of the third- and fifth-grade teacher positions, the uncertainty surrounding fourth grade class sizes has had a negative impact on school enrollment. Twice a year, once in spring and once in fall, the schools count how many students are in attendance that day and submit the figures to the district to consider as part of their funding formula, or how they decide the number of teacher positions a school will receive. “One of the frustrating things is you get funding based on a count in March, but on count day, 20 days into school year, you get a different figure,” said Zimmerman. Because parents concerned about fourth grade class sizes have been moving their kids to private schools, and decreasing the enrollment at Incline Elementary, there’s a chance that the enrollment count this fall will be significantly different from the student count last March. If that happens, the district can remove additional teacher positions. The changes in teacher allocations presents a real challenge to students and teachers, because it forces children to be moved around between different classes. It alters the classroom dynamic and interrupts their routines, Zimmerman said. Still, Zimmerman said things could be worse without Gov. Brian Sandoval’s calling on the legislature to provide the district with funding assistance. “We would have had to cut more teachers,” he said. He said he’s thankful to the parents for speaking up, too.